Like dying of dysentery? Have I got the game for you! Only available at Target, this card game recreates the game that changed the world in stunning detail (I have no idea if that's true, I never played the original, but I assume it is). 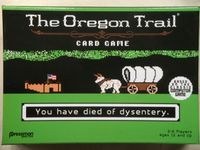 Now you can wander the Oregon trail with your friends and see who dies along the way!